Sarcoscypha austriaca commonly referred to as Scarlet Elfcup (and the macroscopically almost identical Ruby Elfcup Sarcoscypha coccinea) appears in winter on dead twigs in damp, shady places, usually partly buried in moss. In recent years Sarcoscypha austriaca has been the more frequently recorded of the two red elfcup species in Britain and Ireland, whereas in the past Sarcoscypha coccinea was most commonly recorded. Difficulties in identification may be a significant factor in this, of course. 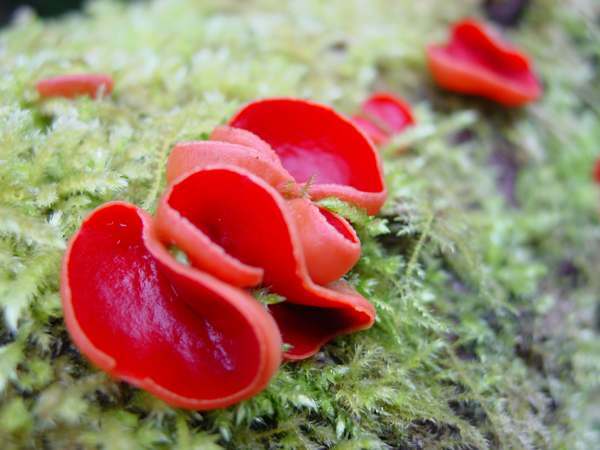 The following discussion appears also on our page for the Ruby Elfcup, Sarcoscypha coccinea. 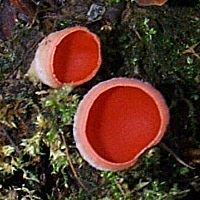 I have almost convinced myself that the Ruby Elfcup is usually a darker red than the Scarlet Elfcup, but as both species can vary considerably in colour from pale orange through to deep red it is simply not sensible to make colour part of the identification process. Ruby Elfcup fruitbodies rarely exceed 5cm across when fully expanded, whereas I have found Scarlet Elfcups more than 7cm across; however, the size overlap is such that again it is no real help in determining which of the two species you have found. A microscope is therefore the only way of being reasonably confident. Even then, it is much better to rely on measuring a set of features rather than gambling on a single observation. 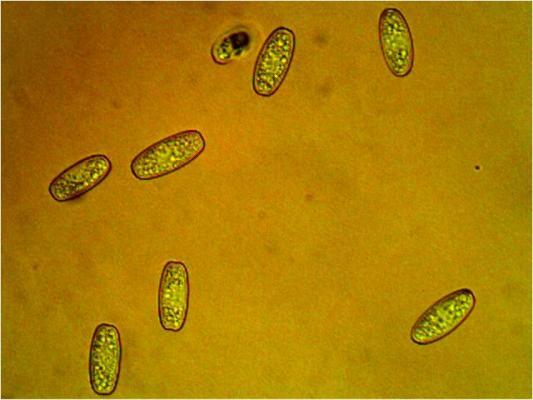 The spores of both of these species are elongated ellipsoids and, unfortunately, with a size overlap; however, some of the mature spores of Sarcoscypha austriaca produce conidial 'buds' which give their ends a hammerhead appearance, whereas the end of spores of Sarcoscypha coccinea are always rounded without budding protrusions. Another distinguishing feature is the hairy outer surface of the cups, which are covered in a matted felt (tomentum) of tiny uncoiled hairs in the case of Sarcoscypha coccinea and coiled (like a corkscrew) hairs in the case of Sarcoscypha austriaca. 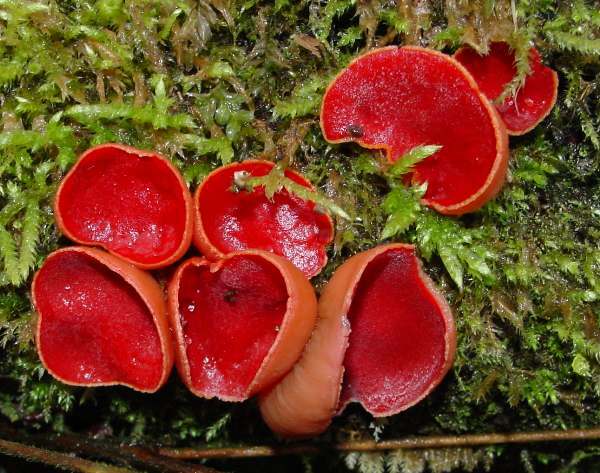 Although distribution information for the two red elfcup species found in Britain goes back many decades, records prior to the turn of the present century may be seriously inaccurate as the distinction between various Sarcoscypha species (worldwide there are quite a few) was not clear until 1997, when American mycologist Francis A Hamilton et al. used molecular sequencing to infer the cladistic (evolutionary) relationships between the species within this difficult genus. Above: Seen through a x400 microscope, the tiny hairs on the surface of a Ruby Elfcup are matted, but they are not coiled. 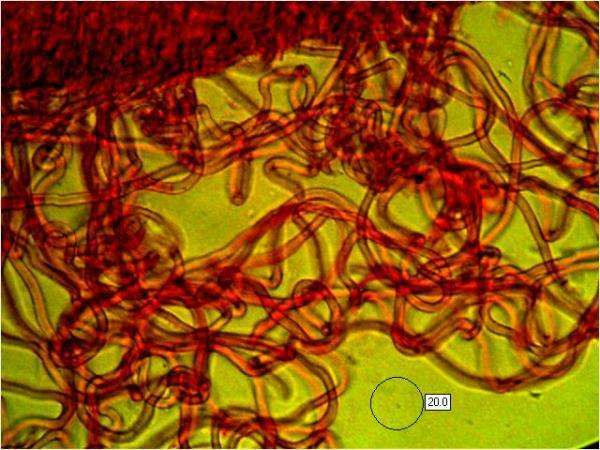 Here, for comparison purposes, is the corresponding photomicrograph for Sarcoscypha austriaca, the Scarlet Elfcup. With this species the hairs (tomentum) on the outer (infertile) surface of the cups are coiled rather than being straightish as they are for the Ruby Elfcup. Some field guides refer to one or other of these two species having the longer stem, but in my experience the depth of moss through which they emerge from their buried timber substrate largely determines the stem length. 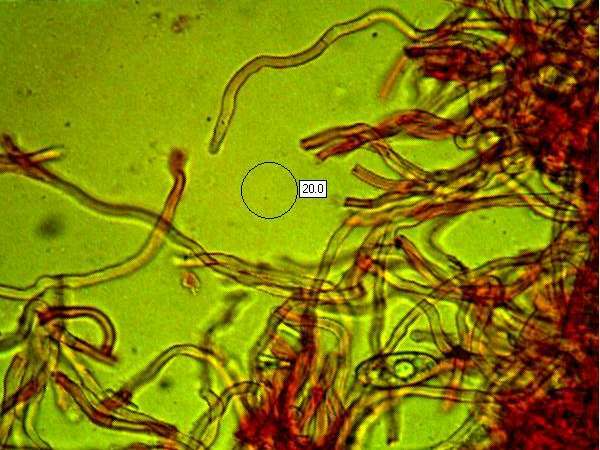 Another discriminating factor could be the substrate upon which these ascomycetes are feeding. Scarlet Elfcup is partial to a wide variety of hardood twigs including Sycamore, willows and Hazel. Ruby Elfcup is also a hardwood rotter, and it occurs on Beech and elms as well as Hazel. So both species can occur on Hazel... and rotten twigs are far from easy to identify to species level! What all this says is that to be anywhere near certain which of the two red elfcup species you have found, microscopic study (unless you are equipped to carry out DNA analysis!) is probably the only option. Fairly frequent and widespread across Britain and Ireland, specially in areas of high rainfall, the Scarlet Elfcup occurs also in many parts of mainland Europe. This ascomycete fungus is also reported from parts of North America. Described in 1884 by Austrian mycologist Günther Beck von Mannagetta und Lerchenau (1856 - 1931), when it was given the scientific name Peziza austriaca, this species was moved to the genus Sarcoscypha in 1907 by French mycologist Jean Louis Emile Boudier (1828 - 1920) and given its current scientific name Sarcoscypha austriaca. The nominate (red) form became Sarcoscypha austriaca var. austriaca when, in 1999, Sarcoscypha austriaca var. lutea (a yellow form) was described by Italian mycologists S Ruini and E Ruedl. Synonyms of Sarcoscypha austriaca include Peziza austriaca Beck. The specific epithet austriaca means 'from Austria' and was chosen by the Austrian mycologist (Beck - see above) who first described this species scientifically. The irregularly shaped cups have a smooth, bright red hymenial (fertile) inner surface and a felted outer surface. Cup diameter ranges from 2 to 7cm when fully expanded; height typically 1 to 2cm. The outer (infertile) surface is paler than the inside, sometimes pinkish but often with an ochre tinge. It is covered in tiny hairs, which in this species are in the form of tangled coils. The curly nature of these hairs is a crucial identifying characteristic, but to see it clearly requires strong magnification. The edges of young cups are often slightly incurved. There is a short stipe or stem, up to 3.5cm long and 0.3-0.7cm wide, often buried in moss or leaf litter. The stipe is the same colour as the outer surface of the cup or somewhat paler. Cylindrical, typically 340 x 14µm. 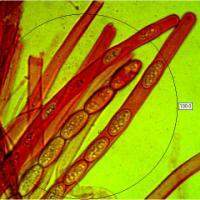 Paraphyses are sterile filamentous hyphae embedded within the hymenium. 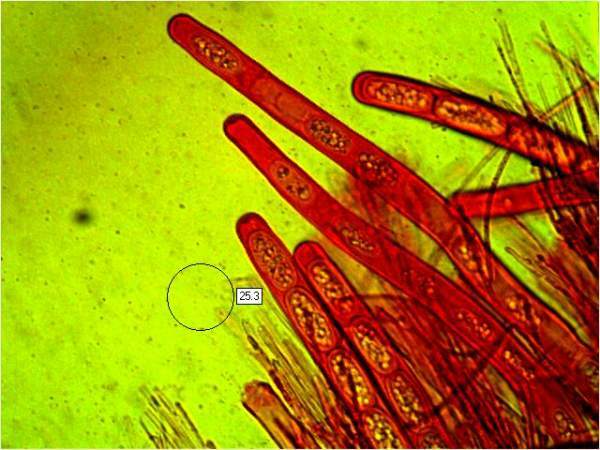 In Sarcoscypha austriaca they are filiform (very thin or needle-like), with a red or orange-red content. Ellipsoidal, 24-32 x 12-14μm; sometimes budding secondary conidial (asexual) spores from flattened or double-humped ends of mature ascospores. 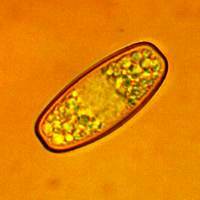 There are usually many small (generally 1 to 3μm in diameter) oil droplets distributed randomly in immature spores but often becoming concentrated towards the ends of the spores once they become fully mature. On fallen hardwood twigs and branches - most often those that are partly buried in moss. From spring through to the end of winter, but most abundant in the colder months. 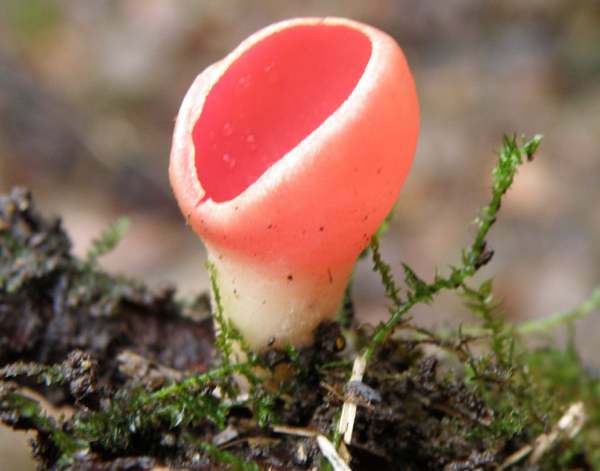 Sarcoscypha-coccinea, the Ruby Elfcup, is virtually indistinguishable via macroscopic characters; it has straightish (uncoiled) hairs on the outer (infertile) surface of the cup and narrower spores that do not produce conidial buds (asexual spores). Aleuria aurantia, the Orange Peel Fungus, is larger, orange rather than red, and grows on soil rather than on wood. The Scarlet Elfcup and its close relative the Ruby Elfcup are considered by some authorities edible as long as they are thoroughly cooked. (Lacking in flavour, their main culinary value must be in the splash of colour that they could add to a mushroom dish.) 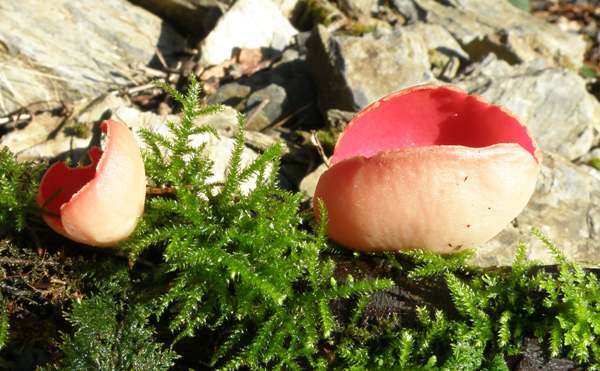 A few field guides now record these fungi as inedible, and some even suggest that they are 'suspect'; therefore we advise against gathering Ruby Elfcups and Scarlet Elfcups for eating. The picture on the left, shown courtesy of Simon Harding, shows a long-stemmed Scarlet Elfcup found in Gloucestershire, England. Harrington F A. (1998). 'Relationships among Sarcoscypha species: evidence from molecular and morphological characters'. Mycologia 90 (2): 235–43. Ruini, S., Ruedl, E. (1998). Un nuovo taxon di Sarcoscypha. S. austriaca var. lutea var. nov. Rivista di Micologia 4: 319-324.